25 cm of textual records. -- 3 audio cassettes. -- 1 photograph : b&w. 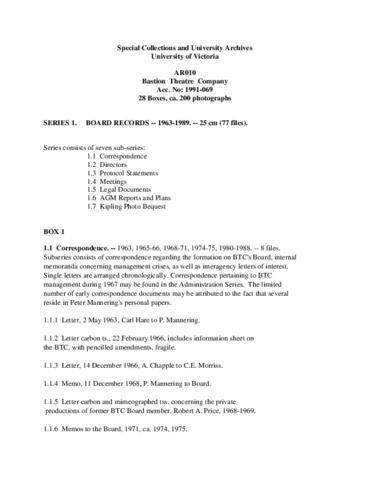 Series consists of the records of the Board of Directors, arranged into seven sub-series: Correspondence, 1963-1988; Directors, 1969-1989; Protocol statements, 1981-1986; Meetings, 1966-1988, predominantly 1980-1988; Legal documents, 1964-1985; AGM reports and plans, 1966-1988; and Kipling photo bequest, [1966?]. Included within this series are records pertaining to the structure and membership of the Board; the incorporation of the Bastion Theatre Society and subsequent name change; reports, plans, and meeting minutes; and a photograph with an attached newspaper clipping on verso. Photograph features Rudyard Kipling with other thespians.